There's perhaps no better feeling than satisfaction with a major purchase. The peace of mind that comes with making the right decision is priceless. As part of our 2017 POPSUGAR Insights Auto Report, we surveyed over 1,200 US millennial female in-market auto shoppers to better understand their perspective on shopping for their next vehicle. Overall, we learned that 90% of millennial women are confident that the next vehicle they ultimately purchase will satisfy their needs. 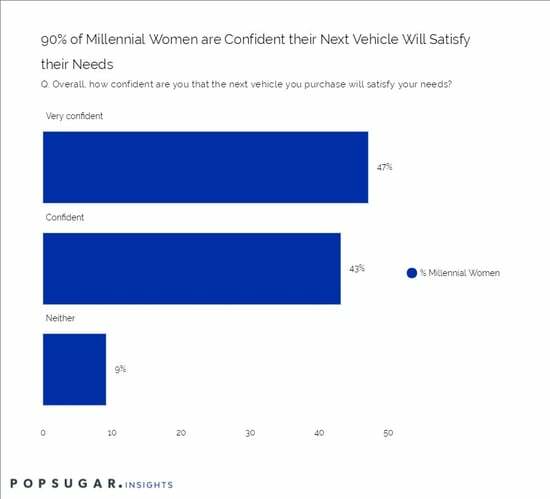 All things considered, 47% of millennial women are "very confident" and 43% are "confident," with only 9% expressing doubt in the ultimate decision they make about which vehicle to purchase. As we illustrated in our initial post, there are areas of the purchasing process where women feel less confident, but overall, they are sure via their research and the available information they'll be able to make the right choice.